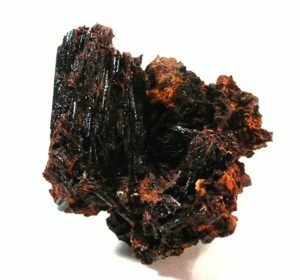 History of Painite | What is Painite? Painite was recognized as a new mineral when it was discovered in a sample in Burma in the 1950s. For decades, only two crystals of this ultra rare mineral were known to exist. Painite was named after its discoverer, British mineralogist Arthur C. D. Pain. No cut gems are currently known. The color of painite varies from dark red to orange-red and brownish. Its color and density closely resembles garnet which means there may be cut gems in existence that have been misidentified as ruby or garnet. Prior to mid-2005, only 25 painites had been found including two that were faceted gemstones. The first painite crystal, weighing 1.7 grams, was donated by Arthur C.D. Pain to the British Museum of Natural History in London. An earlier painite sample was discovered in the British Museum having been misidentified as brown tourmaline with rubies from Mogok, Burma. This sample was found to be painite by electron microprobe analysis in late 2007. A dark, 2.118 gram painite known as Painite #2 is currently on public display in the British Museum. Several painities are in private collections while there rest have been distributed among the British Museum, the Gemological Institute of America, the Smithsonian, the California Institute of Technology, and the Research Laboratory in Lucerne, Switzerland. In early 2006, a large deposit of painite was found in Burma. The painite crystals however were a thick maroon-brown with a significantly lower value than crystals found previously. This new deposit brought the total number of genuine painites known worldwide to 330.